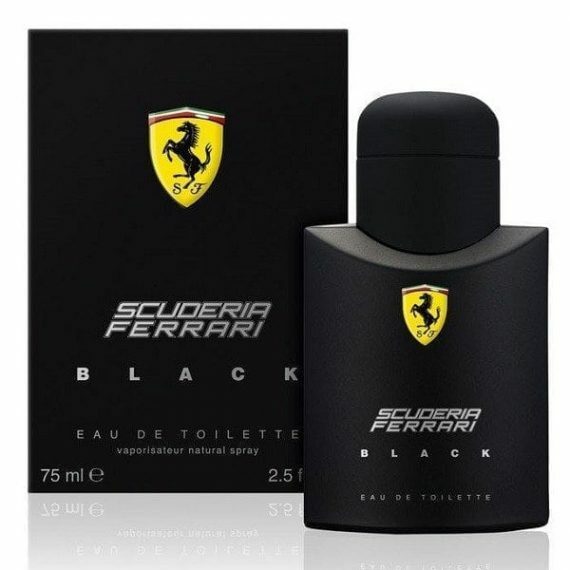 Ferrari Black Eau de Toilette by Ferrari is an Aromatic Fougere masculine fragrance that is both fascinating and desirable. The top notes exude excitement through a combination of Lime, Bergamot, Red apple and Plum. The heart notes of Jasmine, Rose, Cinnamon and Cardamom create a mystery. The base notes of Cedarwood, Vanilla and Amber complete the sensuous scent. The sharp, woody and mossy accords give it a casual yet luxurious fragrance. The predominant note is Red Apple and the perfume has moderate longevity. It was launched in 1999 in a classic black spray bottle and is available to buy in three sizes of EDT – 40ml, 75ml and 125ml.